One of the things that can come along with marriage is the oh-so-wonderful thing called domesticism. Sure, you get a taste of it when you are living away from Mom and Dad in college or as a single person, but for me marriage was the big string cut making me a truly independent person. I am responsible not only for the health and well-being of myself, but also my husband. That being said, I do a fair majority of the cooking. Ben does a good job, but I do have a bit more gusto for it as well as a small amount of experience and plenty of food network watching. I just wanted to share one of our little ghetto (and easy!) 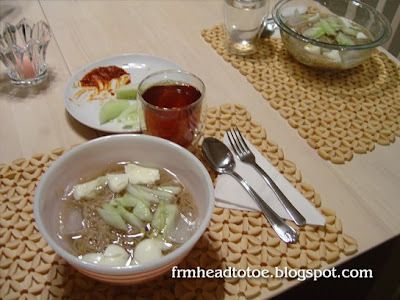 meals of the Korean cold noodle soup dish, mul nengmyun. I didn't have any meat or kimchee on hand to put it in, but cucumbers and boiled egg are really what make the dish toppings, right? Ok, so we didn't even have bowls to put the soup in so we just used pyrex mixing bowls. But it was a dang good meal if I do say so myself! 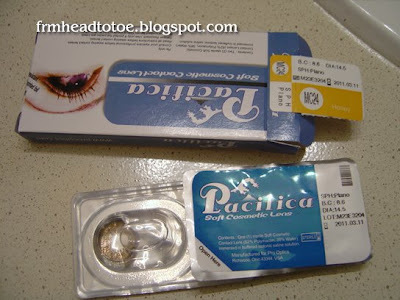 Anyway, I recently received a pair of Pacifica lenses in Honey from the totally awesome Gregg. They are labeled as 3-month lenses and felt pretty comfortable compared to other lenses I've tried. This is a close-up of the lenses in my eyes with flash and without flash. I know the flash photo makes it look almost grey, but that was really the blue tint coming off of the flash. It is a warm honey shade up close which mixes with my eye color to create a golden brown color from talking distance. I really loved the almost sparkly, but natural, look these lenses gave. In terms of makeup, I was preparing for an outdoor daytime shoot in my wedding dress. I wanted to show you guys a better close-up of my wedding makeup so I got another opportunity! I tried to recreate the same look using the same products. Oh my god the contacts are soo beautiful. They really do make a difference! How much did your contacts cost? The false lashes are amazing as well. The makeup is amazing. Ugh everything is perfect haha. what did you do to your hair? who butchered it? it was so nice before? can you do a skincare routine post? what do you use? Haha, wow. Her hair still looks pretty! LOL Jen, if I were to ever go to Kansas, you must (a) cook/feed me (not feed literally) and (b) do my make-up!!!!!! And to anonymous...her hair is not butchered, jeez. Anonymous 2: I recommend intensive or semi-matte, depending on how much coverage you want. It helps to use finishing powder on your t-zone periodically too. haha. you guys are silly. you're sooo pretty. you should just move to korea and become a celebrity! Colored contacts make you look so exotic! I see you've fixed the photo enlarging thing! yay! thanks a lot. They look great on you! And the makeup looks fresh as well! Very complimentry to your features! But your pics of the food made me hungry!! I absolutely love those lenses on you! Do you know where to purchase them? but I don't get the 2 pack thing. Should I just order 1 for the right eye if it's a 2 pack? Do you think Greg can order some for me? The site requires my prescription which is plano, but I don't have it. Hey ii also wear contact lenses. After trying a few ii found Pacifica to be the best!! Their comfortable and natural looking. The other brands have to much of the clear tape which makes it easy to distinguish as contacts!! They look really nice on you. OMG! You're Ben and Jen?? How adorable! Beautiful look, I'll definitely being doing a similar one at my own wedding in October! Wow! the lenses really change the effect don't they?? You're really gorgeous by the way.